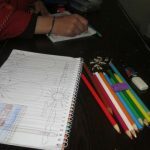 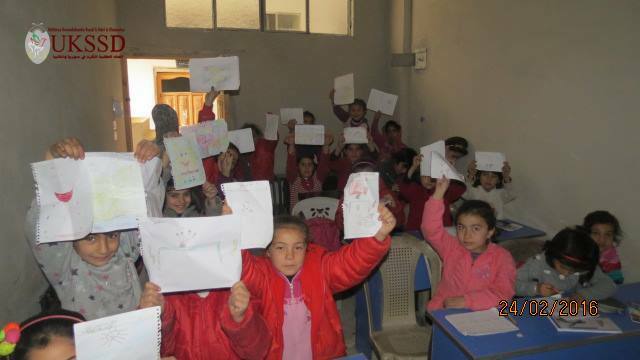 Painting and drawing against everyday drabness | Kobanê, Syria – DOZ e. V.
One of UKSSD’s regular activities is giving space to children for releasing and developing their personal skills in a creative way, for instance by providing space and the necessary material for painting and drawing. 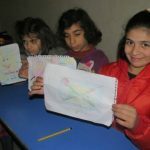 On February 24th, 20 children came again to UKSSD’s local center in Kobanê for spending time together while being supervised by local UKSSD-coordinator Nareen Shekho. 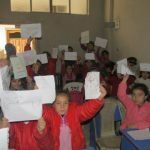 By drawing and painting, these children are being encouraged to express their own thoughts and opinions independently. 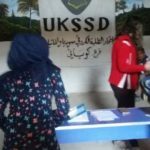 While these meetings might only be a small step in this process, UKSSD is aiming on encouraging children and helping them delevop their self-confidence despite all the lack of perspective caused by the war and the lack of international help. 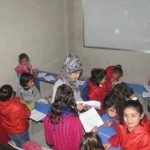 This way, children learn to develop their own perception of social circumstances to understand and to decide on what they want to do, and what not.